← I’m back. Here’s where I’ve been…. This entry was posted in Personal Inspirations. Bookmark the permalink. Well said! Writing is an outlet for me and I don’t write everyday. Sometimes a story cooks in my heads for days before I put it on paper. Finally, I stopped caring about what people think. Perfectionism is indeed the enemy of good! Sometimes its very necessary to let a story cook. I definitely do that too. My first real novel cooked for years because I couldn’t figure a major aspect out relating to the protagonist. Three years after my first ideas for the novel and my first attempt to start it that fell flat, the solution came and I was able to go. For many years I was into writing poetry, because I just couldn’t focus on a long-term fiction project for as long as it would take me to write it. 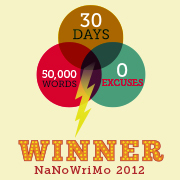 However, last November, I picked up NaNoWriMo again, which I first competed in and won when I was twelve. I wrote half a story in November, then wrote the second half in April, for Camp NaNoWriMo. Currently, two very good friends of mine are editing it for me. In July, I again competed in Camp NaNoWriMo, and wrote half a story. I was feeling a bit discouraged, because I wasn’t writing as much poetry as I had been, but maybe now it’s just time for me to take my writing in a different direction. So it’s pretty much reverse of what you had – you going from novels to poetry, and me going from poetry to novels, but this post helped me not feel so guilty about pursuing a different mode of writing. Thank you! How fun that our paths have flip-flopped, so to speak, over each other! I am enjoying poetry. I love the way it allows me to play with language and I also find that I am less inhibited and less fearful of expressing my true self in poetry, more so than in fiction. Glad to see you are looking at coming back to fiction writing! I know it is difficult sometimes, and I agree that sometime the best thing to do is take a break. That being said, I have always enjoyed your articles and look forward to hearing more from you! Thank you so much, Emily! Hope all is well with you!